I’m the sort of person who has a huge sweet tooth. I love anything that’s sweet, especially puddings. One of my favourite desserts is Creme Brulee, whenever I’m out for dinner and see this on the menu I just can’t help myself. I always thought they were pretty complicated to make so I’ve never tried to give them a go at home, but when Sunrise Care Homes offered me a recipe card to make my favourite dessert I was excited to give it a try. 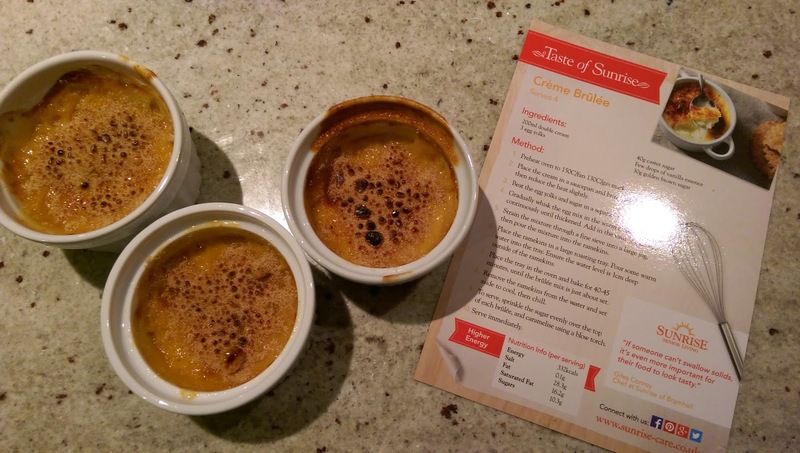 To serve, sprinkle the sugar evenly over the top of each Brulee, and caramelise using a blow torch and eat immediately! I was surprised at how easy these were to make! And with a basic recipe like this it’s easy to change if you’re feeling experimental and add things like raspberries or even chocolate pieces. Of course everyone at home helped me to eat these, and I’m sure won’t object to me trying out different flavours!